Make your own granola bars with ingredients of your choice. 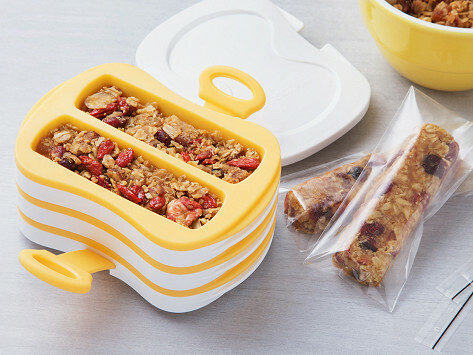 This beautifully-designed granola bar maker presses nuts, fruits, and seeds into compact bars. 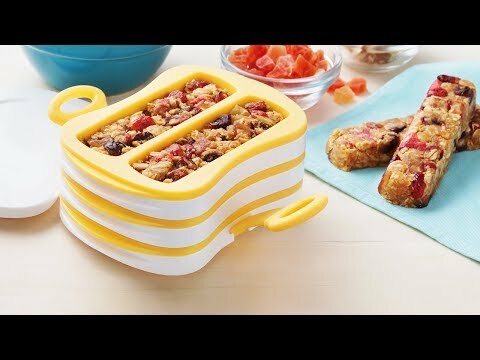 Make six at a time—leave them in the fridge for an hour or use the heat-resistant silicone inserts as baking molds. Dimensions: 6.5" x 5.90 x 4.2"
Easy to make healthy & delicious snack bars. Toasting the nuts before using is key to amazing flavor. Great gift for the healthy foodie! My daughter uses these to make gluten free, dairy free, sugar free snacks for her kids and especially with her kids.